I am usually in awe of the transportation system that the Disney Company manages to pull off with finesse in all its parks. You can travel miles without ever setting foot in your own car! Then there is also transportation within the resorts, if size permits. 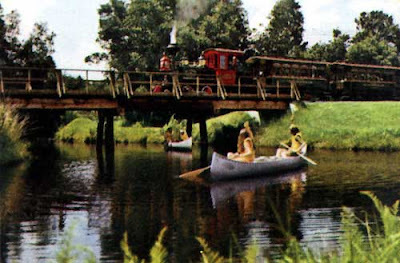 Take Fort Wilderness, for example. Golf carts, bikes, canoes...once upon a time there was even a train! 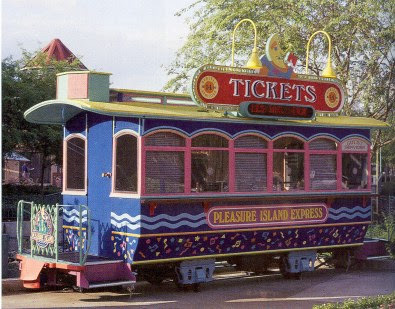 Nowadays, you can still find part of that train at Downtown Disney! Some modes of transportation are long gone...only memories and photos remain. I still have lots of fond memories of gliding over Fantasyland, getting a bird's eye view from the Skyway. Oh I wish it was still in operation so I could spy on the Fantasyland expansion now! Transportation experiences took on a whole new meaning with the introduction of the Exotic Driving Experience at the Speedway! Guests have an opportunity to drive a very fast, very expensive high performance automobile! Walt Disney must have been a bigger fan of transportation than most. This post hardly scratches the surface! Just like The Disney Company started with a mouse...Disney transportation started with a limo! Well...started is a pretty big claim! Still, this is the car that Walt Disney rode to the premier of Snow White in! Yes, even then, he understood the value of getting there in style! Ok, this isn't exactly transportation...but it WILL whisk you away to a place most peaceful....like the Scottish Highlands! This is my daughter's most recent a cappella arrangement. The song is called Learn me Right, by Mumford and Sons and is part of the Brave Soundtrack. My 15 year old is singing all three parts. As a proud mama, I'd love for you to take a listen! 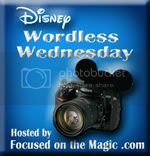 I'd like to thank Deb at Focused on the Magic for hosting this Wordless Wednesday! 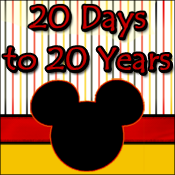 If you didn't get here from over there, please click the link below to see all the great posts about Disney Transportation! I SUPER love your vintage photos!! Oh my love the old and no longer with us photos. So many amazing memories from those days gone by. Yes, we can't have them around forever, but we can keep the memories...and pictures! Oh how I miss the Skyway, thanks for a great set of shots! 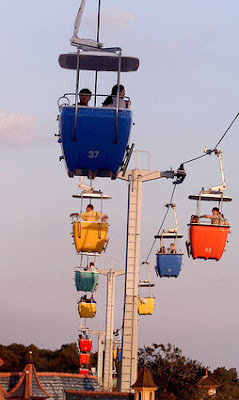 Love your pics, Ami I miss the skyway too, It was awesome to travel over the park. It really was. I felt like I was surveying the land from up there! LOVE the old photos! Thanks for stopping by my blog! I miss the Skyway too. Wouldn't be great to see what's happening in Fantasyland? Last time I rode the old Dumbo I spent the whole time craning my neck to see what was happening. At that time there wasn't a whole heck of a lot to report. Your daughter is so very talented. What a beautiful voice! Very uplifting! You should be very proud!! Thanks for your sweet words about my daughter! She loves to sing! Your daughter can definitely sing! Beautiful version of the song. When you said she sand all 3 parts, I didn't realize that you meant at once. And thanks for the look back at the skyway. That was always a fun ride. :-) Yes! The wonders of garage band on a Mac! Thank you! Love the photos - particularly the Skyway! Your daughter has such a beautiful voice! I have two girls that sing as well - our house is always full of music and I love it! Isn't it wonderful to have a house full of music? Love it! Ami- I love your choices; old and new. My family is still pining for the Skyway days. Thankfully Disney is always moving us forward with new favorites! !